When that ice cream craving hits, it’s time to dig into your keto dessert recipes and take that challenge head-on. Sugar cravings can really throw a wrench in your day, especially if your goal is weight loss. That’s why having low-carb recipes like this one to keep you on track and not throw you off your keto diet can be so instrumental for keto success. Low in net carbs, gluten-free, dairy-free, sugar-free — the only thing this milkshake recipe isn’t free of is deliciousness. Mix it up by adding unsweetened almond milk or a little sugar-free dark chocolate. You can even throw some nut butter in there if you want a protein boost. However you make it, you really can’t go wrong as long as you’re sticking to your keto meal plan. Osteoarthritis(OA) is a common degenerative joint disease that occurs when the cartilage between your joints breaks down, causing pain, stiffness, and swelling[*]. Collagen is a protein found in abundance in your skin and connective tissues — especially cartilage. Joint-supportive nutrients can help ease the symptoms of OA, which makes collagen an excellent choice for OA patients. In one trial, when patients with osteoarthritis took collagen for 90 days, symptoms of osteoarthritis dropped by 40% — with a significant rise in daily activities[*]. In a review of medical literature on collagen supplementation, researchers found that a growing body of papers supports the use of collagen for OA. They discovered that collagen supplementation results in an accumulation of collagen in cartilage and significantly increases the synthesis of cartilage. These findings suggest that collagen may provide an improvement in men and women suffering from OA and should be considered as part of the treatment[*]. When it comes to heart-health, blood lipids play a significant role in the progression of heart disease. Excess triglycerides in your blood can contribute to the hardening of your arteries, which in turn increases your risk of stroke, heart disease, and heart attack[*]. While you’ve probably heard all about the benefits of omega-3 fatty acids, saturated fats and omega-9s also deserve their place in the spotlight. Avocados are rich in monounsaturated fats(MUFA), and coconut milk is rich in saturated fat. One study looked at the difference of plasma lipid levels on those following a low-saturated fat diet vs. a high MUFA diet. The results showed that people on a high MUFA diet had lower triglyceride levels, while a low-saturated fat diet increased triglycerides and decreased good cholesterol[*]. In another trial, researchers gave participants either a diet rich in MUFA from avocado and olive oil, or a diet rich in complex carbohydrates. The results showed that the high MUFA diet had a more significant impact on decreasing plasma triglycerides. This suggests that replacing complex carbs with MUFAs may have a favorable improvement on blood lipids[*]. Nutritional science is changing the story around youthful looking skin. One study found that taking collagen orally may have a beneficial effect on the elasticity of your skin. Elasticity naturally declines with age, leaving skin looking wrinkled and sometimes saggy. After just four weeks of collagen supplementation, women saw statistically significant changes in the elasticity of their skin. They also reported positive effects on skin moisture, but those results were not statistically significant[*]. Lutein and zeaxanthin, two carotenoids in avocado, may protect your skin from sun damage. Animal trials have shown that these two carotenoids act as antioxidants in your skin, protecting it from UV light[*]. These phytochemicals are also well-known for their ability to protect your eyes by acting as antioxidants and shielding them from UV damage. This keto-friendly milkshake will blow your other smoothie recipes out of the water. It’s free of ingredients like sugar alcohols that you typically find in keto desserts and full of real, whole foods like avocado and cauliflower. The best part — it’s versatile. You can throw in some cocoa powder if you have it lying around, or even some sugar-free chocolate chips or hemp seeds to give it a little extra crunch. Top it with some low-carb whipping cream, and voila — you’ve got the most satisfying and health-promoting milkshake around. Who needs salads when you have keto recipes like this? 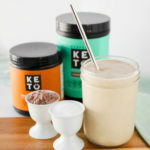 This chocolate caramel keto milkshake is a perfect keto dessert — gluten-free, dairy-free, sugar-free, and zero sugar alcohols — perfect for a healthy low-carb diet. Mix everything into a high-speed blender until smooth.